Are long-term expats being refused entry into Argentina ? The expat community is starting to worry…and they should. Seems like Argentina’s lax approach to north american immigration and long-term “tourism” is no longer the standard. It’s still early, and only a couple cases have been reported, but that fact is that a couple of north americans weren’t allowed into the country when they returned Ezeiza after visiting family in their home countries (U.S.A. and Canada). Here’s what the “rejection” notice looks like. You’ll notice the reason is listed as “pseudo turista”. In 2014 the Argentine Department of Immigration announced a new legal resolution intended to resolve cases of suspected “pseudo tourism” or “false tourism”. This new resolution allows immigration officers to question any foreigners that are entering the country as “tourists” if they suspect them of actually being “false tourists” (residing and working in the country long-term rather than for pure tourism). Immigration officers are allowed to ask for any documentation that could help them determine if the foreigner is in fact complying with policy, such as a return plane ticket, hotel reservation and more. Based on their findings, the foreigner may or may not be allowed to enter Argentina. 1. If you are a “false tourist” (you’ve been living in Argentina for more than 6 months as a “tourist”), then it might be a good idea to talk to an immigration attorney before your next trip to see what options you have and how you should be prepared for this type of situation, and also to have someone to call in the unfortunate chance that you are questioned and not allowed back into Argentina. The baexpats.org forums is a good place to find an attorney recommended by other expats. 2. Try to get residency. Here’s a step by step guide. 3. Try not to worry (very few cases are being reported in the expat community), be friendly and calm when you go through immigrations, be prepared, and stay out of trouble with the law! 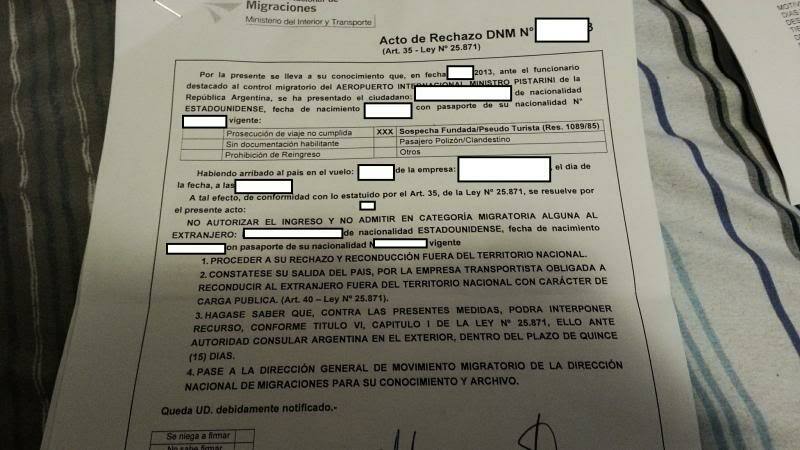 This entry was posted in Expats in Buenos Aires, Living in Buenos Aires, Residency in Argentina, Tourist visa in Argentina, Visas and Residency in Argentina and tagged argentina cracks down on expat immigration, argentina cracks down on perma tourists, argentina deporting expats by Emily Miller. Bookmark the permalink.